As a child of God, you can only offer God one thing that you possess that He does not... YOUR PRAISE! The human voice is capable of making wonderful music, and it can make all of Heaven rejoice if we lift our voices together in harmony and praise the God from whom all blessings flow. This is the idea behind the new Praise & Harmony series. A blending of voices in congregational style worship to the one true Lord of all. We hope the music of our new series will take you to the throne in worship. 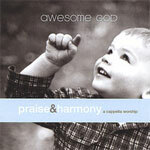 Awesome God is the first first release in the Praise & Harmony series. This album highlights more than 200 vocalists who form the congregation for this outstanding collection of 25 worship songs. As an added bonus, Awesome God includes a vocalist training CD to help you learn your part (soprano, alto, tenor or bass) on each of these great songs. This set is a wonderful teaching tool for churches and singing groups, as well as an exceptional listening and worship experience.